all the time. May through June we cut off the sinuous young garlic scapes from our rocambole garlic and stir-fry or grill them with a touch of olive oil. 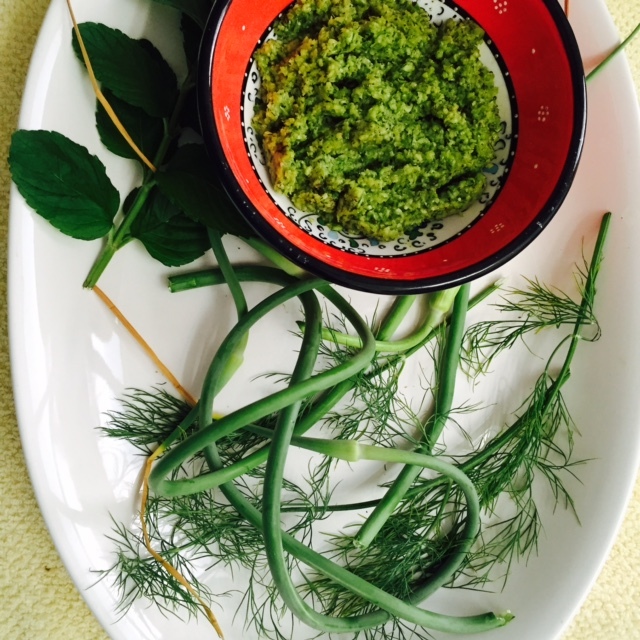 This last week my friend Signe introduced me to Garlic Scape Pesto. 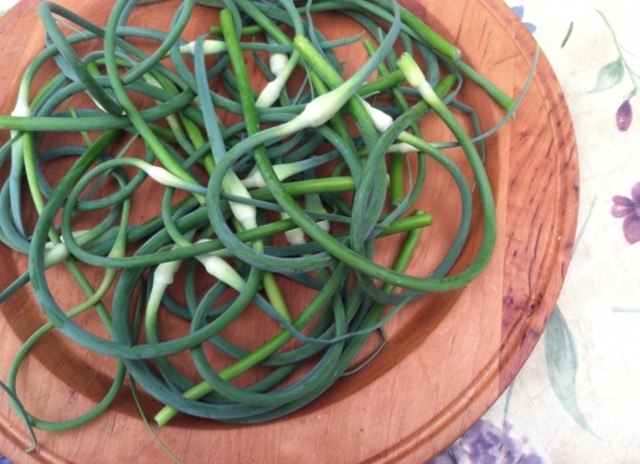 The last of our scapes had flower tips that were drying and stems were a little firm. Sigrid showed us how to peel way the outer skin with a paring knife or vegetable peeler. We discarded the flower heads and cut the stems into 1 inch lengths to run in the food processor. For one cup chopped scapes add 1/2 cup olive and run in process until it’s chunky and add 1/2 cup of Parmesan cheese. It was shockingly good, It’s not unusual to add basil, nuts or sunflower seed. I’ve taken to adding fresh dill and spearmint. So far we’ve enjoyed this was grilled salmon and chicken couscous. The couscous was a real surprise on one of those rushed workday evenings when guests are coming and the rhythm is not quite right in the kitchen. I had not made harissa sauce, a spicy sweet pepper sauce usually accompanying a chicken/vegetable couscous. We served pesto and surprise, we all kept eating eating a bite of couscous and a dab of garlic scape pesto. so if you still have scapes in the garden clip them off and if they still have a bit of tenderness try this recipe. The scapes only occur on the hard neck rocambole garlic varieties. The flowers this garlic produces is invariably sterile. Scapes are lovely in flower arrangements. Place chopped scapes and garlic oil in food processor until coarsely chopped then add cheese and process only until well mixed. Pesto is good with the additions of herbs, spearmint, dill or basil. Blanched chopped almonds, cashews, walnuts or sunflower seeds are other possible additions. I no longer recommend pine nuts because there have problems with some nuts from China and the price is now exorbitant.